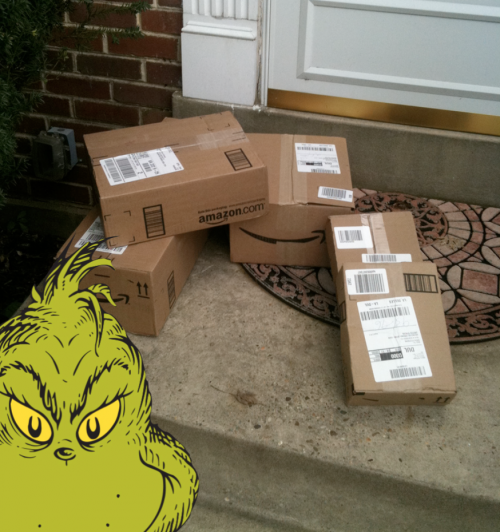 The rise of online shopping at the holiday season highlights some pretty Grinchy behavior. Local news and home security companies have been trumpeting market research about so-called “porch pirates” swiping deliveries before people can get home from work or school to bring them inside. Most of the current solutions for package security aren’t that great. If you don’t feel comfortable trusting Amazon or some other company to remotely run your door locks for deliveries (or if you live in an apartment building without a fancy mailroom), getting packages can be a gamble unless you can route them to a secure delivery site. If someone wants to send you a gift with all the warm intentions of a classic Christmas tradition, their surprise could end up costing everyone a lot more time, money, and stress. That friction between the idea of the gift and the gift itself is a great example of sociological theory at work. Pierre Bourdieu wrote about gift exchanges throughout his work, especially the idea that giving a gift has a “double truth.” People want to show kindness and generosity, expecting nothing in return, but gifts are still exchanged in relationships. That exchange implicitly demands some things: your thanks, your continued commitment to the relationship, and often a different gift at a different time. This seems like a contradiction, but both things can be true because there are different styles of gift-giving tied to time and place. Exchange too quickly and you look like you’re trying to tie up a relationship and move on. Respond too slowly, and it looks like you have forgotten your loved ones. 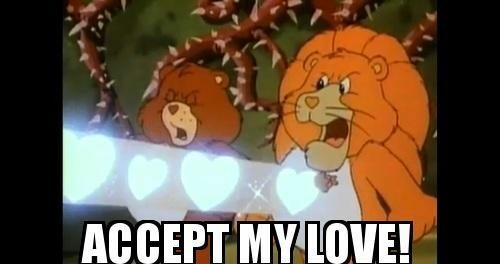 Package pirates put a whole new strain on our relationships at special occasions. Now, if someone mails you a gift, accepting it gracefully might also mean being responsible for its security. What happens if your apartment has said they will not be liable for packages delivered, or your work schedule may not get you home in time to receive them? Do you sound ungrateful if you complain about these things or ask not to receive gifts? On the other hand, it might also become much more rude to send someone a holiday surprise without a heads up first. It is also important to ask ourselves whether we are putting the idea of sending a gift ahead of the actual experience of our loved ones receiving it. This time of year, we often say “it’s the thought that counts.” If that’s true, we might have to think carefully about some of the social norms for sending gifts until the shipping industry can catch up. The recent controversial arrests at a Philadelphia Starbucks, where a manager called the police on two Black men who had only been in the store a few minutes, are an important reminder that bias in the American criminal justice system creates both large scale, dramatic disparities and little, everyday inequalities. Research shows that common misdemeanors are a big part of this, because fines and fees can pile up on people who are more likely to be policed for small infractions. A great example is the common traffic ticket. Some drivers who get pulled over get a ticket, while others get let off with a warning. Does that discretion shake out differently depending on the driver’s race? The Stanford Open Policing Project has collected data on over 60 million traffic stops, and a working paper from the project finds that Black and Hispanic drivers are more likely to be ticketed or searched at a stop than white drivers. To see some of these patterns in a quick exercise, we pulled the project’s data on over four million stop records from Illinois and over eight million records from South Carolina. 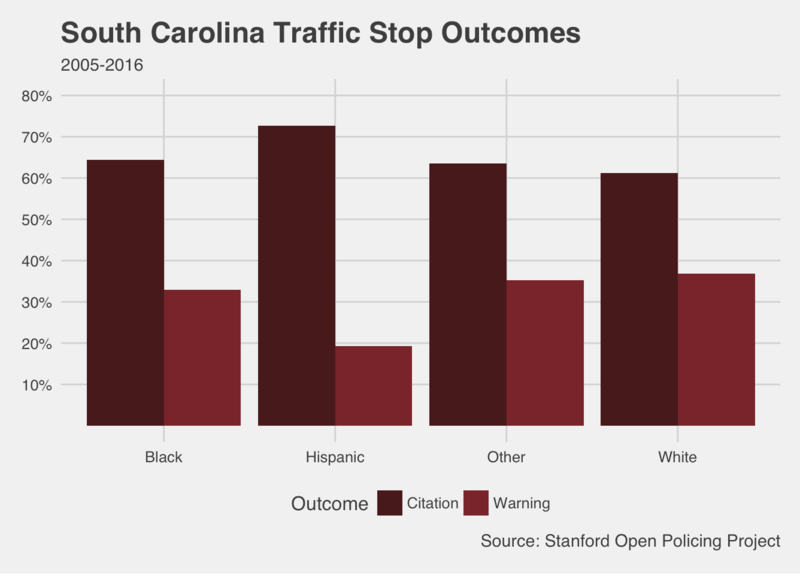 These charts are only a first look—we split the recorded outcomes of stops across the different codes for driver race available in the data and didn’t control for additional factors. However, they give a troubling basic picture about who gets a ticket and who drives away with a warning. These charts show more dramatic disparities in South Carolina, but a larger proportion of white drivers who were stopped got off with warnings (and fewer got tickets) in Illinois as well. In fact, with millions of observations in each data set, differences of even a few percentage points can represent hundreds, even thousands of drivers. 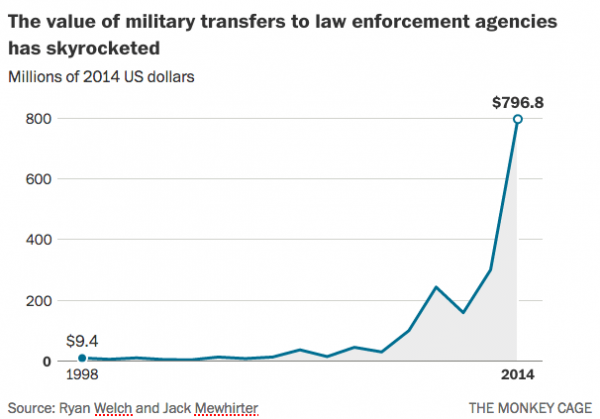 Think about how much revenue those tickets bring in, and who has to pay them. In the criminal justice system, the little things can add up quickly. Are We Really Looking at Body Cameras? 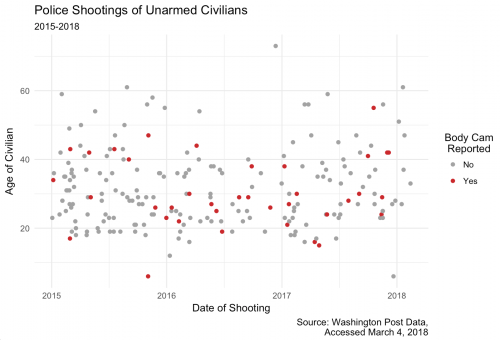 The Washington Post has been collecting data on documented fatal police shootings of civilians since 2015, and they recently released an update to the data set with incidents through the beginning of 2018. 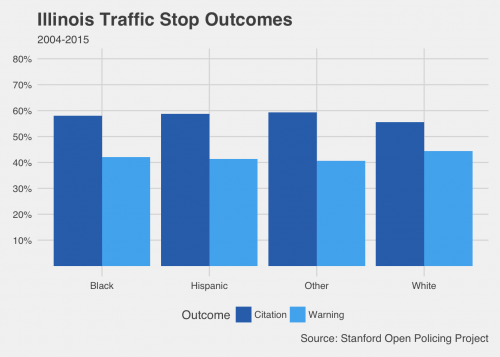 Over at Sociology Toolbox, Todd Beer has a great summary of the data set and a number of charts on how these shootings break down by race. One of the main policy reforms suggested to address this problem is body cameras—the idea being that video evidence will reduce the number of killings by monitoring police behavior. Of course, not all police departments implement these cameras and their impact may be quite small. One small way to address these problems is public visibility and pressure. So, how often are body cameras incorporated into incident reporting? Not that often, it turns out. 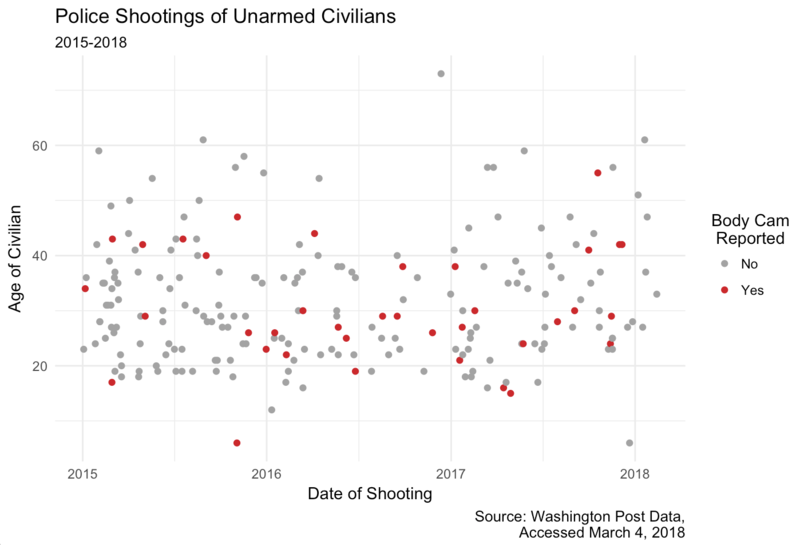 I looked at all the shootings of unarmed civilians in The Washington Post’s dataset, flagging the ones where news reports indicated a body camera was in use. The measure isn’t perfect, but it lends some important context. Body cameras were only logged in 37 of 219 cases—about 17% of the time—and a log doesn’t necessarily mean the camera present was even recording. Sociologists know that organizations are often slow to implement new policies, and they don’t often just bend to public pressure. But there also hasn’t been a change in the reporting of body cameras, and this highlights another potential stumbling block as we track efforts for police reform. 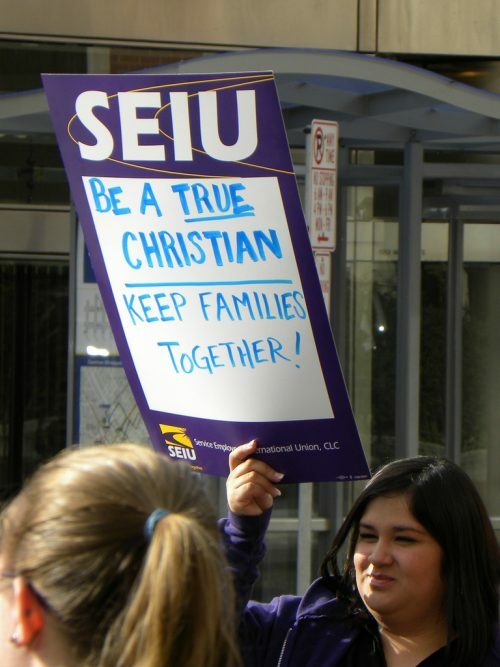 Over at Family Inequality, Phil Cohen has a list of demographic facts you should know cold. They include basic figures like the US population (326 million), and how many Americans have a BA or higher (30%). These got me thinking—if we want to have smarter conversations and fight fake news, it is also helpful to know which way things are moving. “What’s Trending?” is a post series at Sociological Images with quick looks at what’s up, what’s down, and what sociologists have to say about it. You may have heard about a recent spike in the murder rate across major U.S. cities last year. It was a key talking point for the Trump campaign on policing policy, but it also may be leveling off. 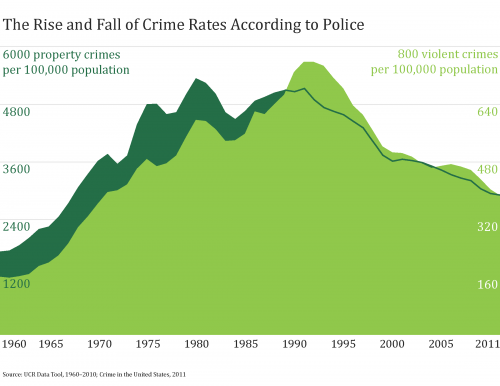 Social scientists can also help put this bounce into context, because violent and property crimes in the U.S. have been going down for the past twenty years. You can read more on the social sources of this drop in a feature post at The Society Pages. Neighborhood safety is a serious issue, but the data on crime rates doesn’t always support the drama. There has been a lot of great discussion, research, and reporting on the promise and pitfalls of algorithmic decisionmaking in the past few years. As Cathy O’Neil nicely shows in her Weapons of Math Destruction (and associated columns), algorithmic decisionmaking has become increasingly important in domains as diverse as credit, insurance, education, and criminal justice. The algorithms O’Neil studies are characterized by their opacity, their scale, and their capacity to damage. Much of the public debate has focused on a class of algorithms employed in criminal justice, especially in sentencing and parole decisions. As scholars like Bernard Harcourt and Jonathan Simon have noted, criminal justice has been a testing ground for algorithmic decisionmaking since the early 20th century. But most of these early efforts had limited reach (low scale), and they were often published in scholarly venues (low opacity). Modern algorithms are proprietary, and are increasingly employed to decide the sentences or parole decisions for entire states. “Code of Silence,” Rebecca Wexler’s new piece in Washington Monthly, explores one such influential algorithm: COMPAS (also the study of an extensive, if contested, ProPublica report). Like O’Neil, Wexler focuses on the problem of opacity. The COMPAS algorithm is owned by a for-profit company, Northpointe, and the details of the algorithm are protected by trade secret law. The problems here are both obvious and massive, as Wexler documents. Beyond the issue of secrecy, though, one issue struck me in reading Wexler’s account. One of the main justifications for a tool like COMPAS is that it reduces subjectivity in decisionmaking. The problems here are real: we know that decisionmakers at every point in the criminal justice system treat white and black individuals differently, from who gets stopped and frisked to who receives the death penalty. Complex, secretive algorithms like COMPAS are supposed to help solve this problem by turning the process of making consequential decisions into a mechanically objective one – no subjectivity, no bias. Based on the screener’s observations, is this person a suspected or admitted gang member? In your neighborhood, have some of your friends or family been crime victims? How often do you have barely enough money to get by? This story was all too familiar to me from Emily Bosk’s work on similar decisionmaking systems in the child welfare system where case workers must answer similarly subjective questions about parental behaviors and problems in order to produce a seemingly objective score used to make decisions about removing children from home in cases of abuse and neglect. A statistical scoring system that takes subjective inputs (and it’s hard to imagine one that doesn’t) can’t produce a perfectly objective decision. To put it differently: this sort of algorithmic decisionmaking replaces your biases with someone else’s biases. Dan Hirschman is a professor of sociology at Brown University. He writes for scatterplot and is an editor of the ASA blog Work in Progress. 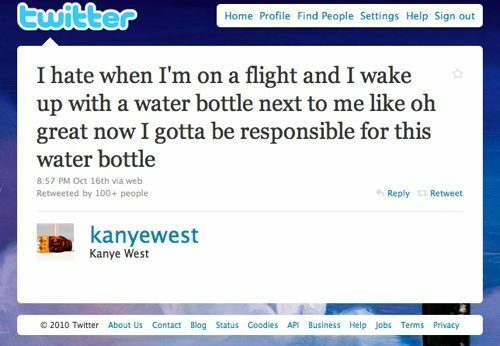 You can follow him on Twitter.